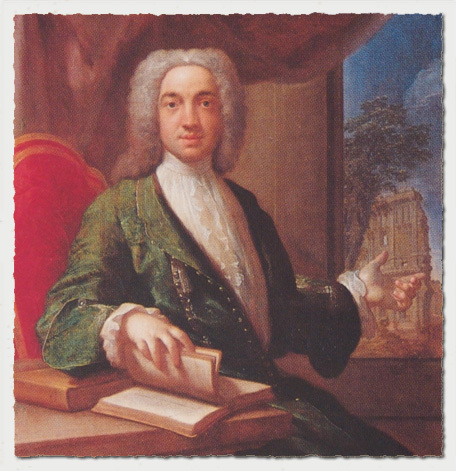 The above picture of Sir Edward is thought to be by Francesco Trevisani [Wikipedia], painted during the period of Sir Edward's Grand Tour (1723-1726). He married on 26th November 1726 to Mary, daughter and heiress of Sir Francis Hungate, Bart of Huddlestone Hall, by Mary, the only daughter of William Weld Esq., of Lulworth Castle, in the county of Dorset. During the period of the tenure of Richard Oliver Gascoigne, the basis of the estate was challenged in the courts as to the entitlement to certain portions of the estate, namely those that had come to the Gascoignes as a consequence of the marriage of Sir Edward Gascoigne to Mary daughter of Sir Francis Hungate. The famous law-suit Hungate vs Gascoigne was fought between the years 1830 and 1833. This case was brought by a William Anning Hungate, a lieutenant in the navy, who called himself Sir William and claimed descent in the direct male line from the brother of the father of Sir Francis Hungate, (i.e Mary Hungate's great uncle). He was unsuccessful! He was a Roman Catholic and known Papist. This period was noted for the Jacobite unrest. His will dated September 1742, months before departure. With the death of Sir Edward, his son [Also Edward] became the 7th Baronet, he was born at Parlington 11th February 1743 and taken to Cambrai, when only three months old. [Does this fact lend weight to the view that Sir Edward and family left in some haste. Taking a small child on such a journey, could be seen as a risk.] The young heir may have remained in France throughout his youth as there is no record of him visiting England. He died in Paris of smallpox on 16th June 1762. Contemporary writers have suggested that Sir Edward was not exactly the life and soul of the party . A quiet and careful individual he kept a diary of his day to day activities. This enables us to be aware of some of his contribtions to Parlington Hall. 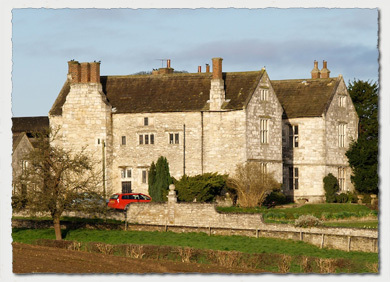 Prior to Sir Edward scant information exists about the house, although it was already established at the time the Gascoignes' purchased the estate in the sixteenth century. The best evidence comes from a seminal piece by Samual Buck, titled Samuel Buck's Yorkshire Sketchbook . A facsimile was produced in 1979 by Wakefield Historical Publications. Click on the note icon to read the notes from the inside of the book dust cover. The important manuscript here published for the first time is a unique record of views of Yorkshire towns and country houses. These are all drawn by one man in the first quarter of the eighteenth century. 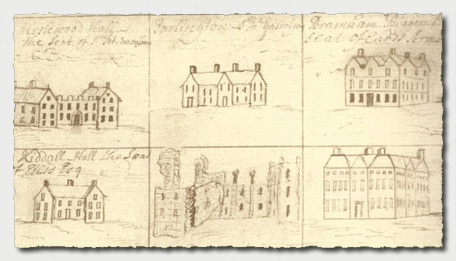 This man was Samuel Buck (1696-1779) architectural draughtsman, who prepared these sketches in connection with the work of his patron John Warburton, Somerset Herald. Evidence for the dating of the sketches can be found in the diary of Ralph Thoresby who records them being prepared in 1719-1720, and internal evidence of the drawings places some earlier than this. Wakefield Historical Publications are publishing the sketchbook in facsimile, printed by Scolar Press, with a scholarly introduction by Dr Ivan Hall. A very substantial undertaking containing well over 200 hundred sketches, the town prospects include Barnsley, Bevereley, Bradford, Guisborough, Knaresborough, Leeds, Rotherham, Wakefield, Yarm, and many more. 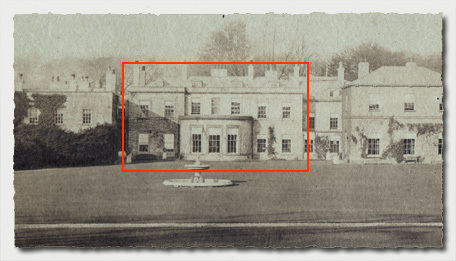 Most of the major and minor country houses are shown, often before subsequent alterations which have obscured their early features, and the drawings include intricate detail of garden layout. In many cases the buildings which he drew have been destroyed, so that these sketches arte the only remaining memorials. The manuscript is often referred to by architectural historians but has never before been directly available for general use. The sketches form a detailed and delightful record of the Yorkshire of 250 years ago. A limited edition only is being prepared, available May 1979. Parlington Hall features at the centre top of this image, the sketch is very different from any of the later details available and makes it difficult to evaluate how the structure depicted here fits with the later information.